MR. COUGHLAN: May it please you, Sir. I am now going to give a further outline statement at your direction, Sir. 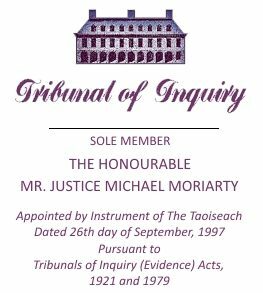 The evidence with which the Tribunal would be dealing during these sittings concerns, in the first instance, Mr. Michael Lowry and Mr. Charles Haughey. With a number of short adjournments as circumstances may require from time to time, it is hoped that the Tribunal will sit until the end of July. For hearing purposes, various items will be grouped together. At appropriate intervals, a more definitive outline statement will precede the calling of evidence in relation to these grouped items. A: The sources of funds in the various bank accounts kept by and the other accounts kept by Mr. Michael Lowry, together with the consequential issues raised in the context of Terms of Reference (e) and (f). I will, at a later point, outline in more comprehensive terms, the nature of the evidence to be called in relation to these matters. B: The next item with which the Tribunal will be dealing concerns Mr. Charles Haughey and specifically the accounts kept by Mr. Haughey in his own name in Guinness & Mahon between 1979 and 1987, the date when the accounts in his name at Guinness & Mahon ceased to be held. This evidence will be led with respect to Terms of Reference A and B of the Tribunal’s Terms of Reference. The Tribunal will examine evidence concerning the sum in excess of £1.5 million lodged to these accounts over that period of time. In addition, certain other accounts of Mr. Haughey and other sources of funds in his accounts will be examined including loan accounts of Mr. Haughey held both inside and outside the jurisdiction. The evidence will touch on other matters including, for instance, the Ansbacher accounts but only in a peripheral way at this stage. D: A number of other matters, some substantial and again, some purely incidental, will be dealt with from time to time. In some cases consideration will have to be given to conducting part of these hearings otherwise than in public in view of the fact that information may have to be elicited from bank witnesses who by reason of their duties of confidentiality have not been available to furnish information to the Tribunal to date. E: The Tribunal is still engaged in investigatory work concerning a number of other matters which it is hoped will be dealt with between now and the end of July. However, because of the status of these investigations at this point, it would not be appropriate to identify the items until such time as such further investigatory work has been carried out. A number of other subparagraphs of the Terms of Reference are also concerned with Mr. Lowry but the material to which reference will be made in the evidence at these sittings will not be specifically directed to those Terms of Reference. The other Terms of Reference are Terms of Reference subparagraphs (g), (h), (l), and (j). In endeavouring to establish whether any substantial payments were made to Mr. Lowry within the meaning of Term of Reference (e) and in endeavouring to establish the source of funds held in Mr. Lowry’s bank accounts within the meaning of Term of Reference (f), the Tribunal has sought to assemble all of the available financial information concerning Mr. Lowry’s affairs. To this end, the Tribunal has sought and been given full access to all information regarding Mr. Lowry’s accounts, both his accounts within the State and accounts he held offshore. The Tribunal has also been given access to the books and records of Garuda Limited, a company effectively controlled by Mr. Lowry. This company traded as Streamline Enterprises Limited, the business operated by Mr. Lowry during most of the time he has held public office as a TD and of which he continued to be a Director, though so far as the Tribunal can judge, no longer an Executive while he was a Minister. The manner in which Mr. Lowry conducted his business and specifically the relationship between that business and Dunnes Stores has already been canvassed in the report of the Tribunal of Inquiry (Dunnes payments) commonly known as the McCracken Report. At this point, it may be useful to refer to the extent to which the Terms of Reference of the McCracken Tribunal and that of this Tribunal impinge on one another. Where Mr. Michael Lowry was concerned, the McCracken Tribunal examined payments in cash or in kind directly or indirectly, whether authorised or unauthorized within or without the State, made to or received by Mr. Lowry from Dunnes Stores related companies and/or Mr. Bernard Dunne between the 1st January 1986 and the 31st December 1996. The Terms of Reference of this Tribunal require the Tribunal to examine whether any substantial payments were made to Mr. Lowry during any period when he held public office and also to inquire into the source of any monies held in various bank accounts for Mr. Lowry with the latter inquiry without limitation as to time. Mr. Lowry has informed the Tribunal that with the exception of the items or class of items to which reference will be made in a moment, the only sources of income he had during the period covered by the McCracken Tribunal and up to the passing of the Resolution leading to the establishment of this Tribunal, were, in the main, income from his work as a public representative and the income and any other receipts from the work carried out by Streamline Enterprises Limited to include payments made to him directly by Dunnes Stores in connection with the Streamline work. Mr. Lowry has informed the Tribunal that effectively and with one or two exceptions, Dunnes Stores was Streamline’s only client. This is the conclusion of the McCracken Tribunal and indeed the Report of that Tribunal went further to suggest that, in effect, the work being carried out by Mr. Lowry and Streamline was so intimately connected with Dunnes Stores that Streamline and Mr. Lowry could together be regarded as merely a division of Dunnes Stores. On the basis therefore of what Mr. Lowry has informed the Tribunal, there is a significant overlap between the result of this Tribunal’s investigations and the investigations of and inquiry carried out by the McCracken Tribunal in as much as the McCracken Tribunal reported on payments by Dunnes Stores to Mr. Lowry and this Tribunal investigating payments to and sources of income to Mr. Lowry has been informed by Mr. Lowry that Dunnes Stores was the main source of those payments and of that income. The Tribunal has examined Mr. Lowry’s sources of income and the lodgments to his various bank accounts. The Tribunal has requested Mr. Lowry to identify the sources of the lodgments to his various bank accounts. Most of these lodgments appear to be identifiable with Mr. Lowry’s income receipts from his business and other sources of income. There are, however, a number of lodgments to which the attention of Mr. Lowry has been drawn by the Tribunal for his comments on the basis that they cannot be readily so identified with his known sources of income. This exercise has been carried out with the assistance of Mr. Lowry’s accountants and has resulted in the isolation of a number of matters in respect of which the Tribunal has yet not obtained precise information. Much of this material has also been canvassed by the McCracken Tribunal. This Tribunal has re-examined these matters in that since that it commenced its work, one or two further pieces of information have come to hand and it is hoped on a further re-examination of payments from the point of view of Mr. Lowry’s accounts as opposed to from the standpoint of the McCracken Tribunal, it might be possible to identify either the source of payments or the source of funds. This has resulted in the clarification of one additional sum paid by Dunnes Stores and it has drawn attention to another sum mentioned and is part accounted for in the McCracken Report. The Dunnes payment consisted of £15,000 paid from the Ben Dunne, Marino Account, to Mr. Lowry. In the course of the proceedings of the McCracken Tribunal, this was thought to have originated elsewhere. Following the conclusion of the proceedings of the McCracken Tribunal, the more up-to-date information was communicated to Mr. Justice McCracken and also to this Tribunal. The other sum relates to a lodgement of sterling £100,000 to an offshore account and is mentioned in the McCracken Tribunal report at page 25. A: A payment of £25,000 cash from Mr. Bill Maher of Maher Meats, credited to Mr. Lowry’s, AIB, Dame Street Current Account in or about the 23rd December 1992. B: The sum of £10,000 lodged to Mr. Lowry’s, Bank of Ireland, Thurles Account, on the 15th May 1992 and paid to him by Whelan Frozen Foods Limited of Inchicore, Dublin 8. C: The sum of £35,000 cash paid by a Mr. Patrick Doherty to Mr. Lowry in May 1995. D: The deposit of sterling £100,000 just mentioned. This sum was deposited by Mr. Lowry in a subsidiary branch of Allied Irish Banks in the Channel Islands on the 3rd September 1991. This deposit is referred to at page 25 of the McCracken Report. It was a conclusion of the McCracken Tribunal that of that sterling £100,000, a sum of sterling £34,100 consisted of a payment from Dunnes Stores. Mr. Lowry has been asked to comment on and to account for the source of the balance of the funds in that account. E: Lastly, Mr. Lowry received certain assistance from the late Mr. Michael Holly in connection with a purchase by him of premises at 43 Carysfort Avenue, Blackrock in the County of Dublin. The circumstances of this relationship with Mr. Holly will be referred to in a moment. On examining the sources of funds in Mr. Lowry’s account, the Tribunal learned that the sum of £25,000 was credited to Mr. Lowry’s Allied Irish Bank, Dame Street, Current Account No. 41179269 on the 23rd December 1992. The source of this lodgement appeared to be a cash payment from Mr. Bill Maher of Maher Meat Packers. Mr. Michael Lowry has informed the Tribunal of this £25,000 payment and of the source of it and has also informed the Tribunal that the £25,000 was paid in respect of refrigeration consultancy work by him for Mr. Maher’s companies. Mr. Maher has confirmed that he was the source of the £25,000. He has also confirmed that this sum was paid in cash and that it was in respect of certain works carried out by Mr. Lowry at Mr. Maher’s request in relation to a number of projects between 1990 and 1992. Mr. Maher, who is resident outside the jurisdiction has made a statement to the Tribunal but has so far refused to attend to give evidence. The Tribunal is not in a position to compel Mr. Maher’s attendance in as much as a Witness Summons cannot be served on him as long as he is outside the jurisdiction. Mr. Lowry has also informed the Tribunal that from the late 1980s, he regularly advised Mr. Maher on various queries concerning the refrigeration of meat processing plants although these devices did not relate to any specific location. He said however that in 1990 he did his first specific project for Mr. Maher at Buckingham Road Industrial Estate at Brackley, Northampton, that he worked on two further projects for Mr. Maher, one in relation to the same location but connected with a larger and different unit and the third involved advice on existing refrigeration equipment which Mr. Maher had at Central Smithfield Market in London. In response to correspondence from the Tribunal, Mr. Lowry has informed the Tribunal that there was no agreement between him and Mr. Maher as to the method of payment nor was any rate agreed. In fact, the actual amount paid was not the subject of negotiation but was determined solely by Mr. Maher who paid Mr. Lowry, unilaterally, after the event. Mr. Maher, in a letter to the Tribunal, has informed the Tribunal that his dealings with Mr. Lowry have been strictly business related and that he paid him for work in connection with the matters mentioned above and a number of other matters. In addition, Mr. Maher has informed the Tribunal that he believed that an understanding existed that part of the payment would constitute a retaining of advice if required at any time in the future. Further, he believed that the £25,000 was very good value for the work done and that it accurately reflected Mr. Lowry’s input. While the payment was made in cash, it should be borne in mind that the sum of money in question was placed in a bank account by Mr. Lowry in an account in his own name. The documentation made available to the Tribunal by Mr. Lowry concerning the work is somewhat limited and the question which arises for consideration at the Tribunal’s public sittings is whether the source of the sum of £25,000 was a contract with Mr. Maher or some other arrangement; whether or not, in other words, the payment of £25,000 was in fact remuneration for the work done having regard to the practice in the industry, where the only available documentary material does not appear to reflect the extent of the work done — though it should be borne in mind and the Tribunal will hear evidence that other documentation came into existence but has not been retained. Turning now to Mr. Patrick Doherty. From the documents produced to the Tribunal in connection with Mr. Lowry’s, AIB, Dame Street Account No. 1/L/11741/025, it appears that there was a lodgement of £32,950.20 on the 19th May 1995. From information made available by Mr. Lowry, this lodgement appears to comprise the bulk of the sum of £35,000 paid to Mr. Lowry by Mr. Patrick Doherty in 1995 for the sale of certain antiques by Mr. Lowry to Mr. Doherty. At the time of the transaction, Mr. Doherty had been known to Mr. Lowry socially and through horse racing circles for a number of years. Also Mr. Doherty had an apartment in the apartment building Finsbury House where Mr. Lowry also had an apartment from November 1995. In the course of social encounter, the conversation turned to antiques and Mr. Lowry indicated that he was interested in selling some antiques which he described to Mr. Doherty. Mr. Doherty agreed to inspect the items and at the inspection, requested Mr. Lowry to obtain an independent valuation. This was done, although it does not appear that the valuation was prepared for the purpose of sale. In any case, the valuation, provided by a local firm of antique dealers, appraised the items which Mr. Lowry was prepared to sell at in or around £39,000. Mr. Doherty agreed to pay £35,000 and Mr. Lowry requested that the payment be in cash. Mr. Lowry has informed the Tribunal that by this request, he intended to convey his requirement that the articles in question should be paid for otherwise than by cheque and that the sale should not be on credit terms, that is the goods should be paid for as delivery was taken. Mr. Doherty took Mr. Lowry at his word and made the payment in cash in a large A4 envelope. As with the work done for Mr. Maher, the question is whether this transaction occurring as it did, was value for money and both Mr. Lowry and Mr. Doherty will give evidence to the effect that it was. Dealing with Whelan Frozen Foods Limited, the aspect of this transaction which requires scrutiny is the fact that, once again, as with the Maher Meat Packers transaction, there was no predetermined rate agreed between the parties for the work; nor any rate per hour agreed or any rate agreed by reference to the value of the work being done and the fact that the amount was subsequently determined not by negotiation but unilaterally by the person receiving the service. This was a payment which it was thought in the course of the proceedings of the McCracken Tribunal had originated in Allied Irish Bank, Donnybrook. It now appears that the transaction in question involved a bank giro from AIB Donnybrook, funded by a debit from the Marino branch, Bank of Ireland account of Bernard Dunne t/a Dunnes Stores. Mr. Lowry has informed the Tribunal that on that date he is of the view that this was in the nature of a bonus payment by Ben Dunne coming within the class of payments by Ben Dunne to him as opposed to Streamline Enterprises as described in the McCracken Report. The deposit of sterling £100,000 in Allied Irish Banks Channel Islands is referred to at page 25 of the Report of the McCracken Tribunal. The Report concluded that sterling £34,100 of that deposit represented the proceeds of a sterling payment of that amount from Dunnes Stores to Streamline Enterprises and referred to at 8 in the Tenth Schedule to the Report. In documents and information provided to the Tribunal by Mr. Lowry and by Allied Irish Banks, Channel Islands (on the authority of Mr. Lowry), it appears that an account was first opened by Mr. Lowry in January 1991. The account appears to have been opened on behalf of Mr. Lowry on the instructions of Allied Irish Bank, O’Connell Street, Dublin. A sum of sterling £55,000 was deposited to the account on the 17th January 1991, being the proceeds of a sterling draft drawn on Allied Irish Bank, O’Connell Street and payable to Allied Irish Bank, Channel Islands. Mr. Lowry has been unable to identify the source or sources of the monies which funded the draft but believes that the money may have been the proceeds of sterling cheque payment by Dunnes Stores to Streamline Enterprises and listed in the Tenth Schedule to the Report of the McCracken Tribunal. The deposit matured on the 17th July 1991 and instructions were again given through Allied Irish Bank, O’Connell Street, to forward the funds to that branch. It appears that the proceeds of the deposit being sterling £58,337.28 together with the Dunnes payment of £34,100 (identified in the Report of the McCracken Tribunal) and a further sterling draft of £7,562.72 dated the 30th August 1991 and drawn on Allied Irish Bank, Dame Street, Dublin 2, amounting in total to sterling £100,000 was redeposited on the 3rd September 1991. Mr. Lowry is unable to source the sources of the monies which fund the draft for sterling £7,562.72. In the course of its public sittings, the Tribunal will inquire into the sources of the monies which funded these two drafts for £55,000 sterling, dated the 14th January 1991 and drawn on Allied Irish Bank, O’Connell Street and for sterling £7,562.72, dated the 30th August 1991 and drawn on Allied Irish Bank, Dame Street. The Tribunal will also inquire into the circumstances in which an offshore foreign currency account, which would have required the grant of exchange control approval, was opened through Allied Irish Bank, O’Connell Street without any apparent application to the Central Bank. In endeavouring to ascertain whether or not the source of the monies which funded these two drafts was the sterling cheque payment by Dunnes Stores to Streamline Enterprises, the Tribunal has addressed certain queries to Allied Irish Banks. To date, the Tribunal has not succeeded in obtaining a comprehensive response to these queries although witnesses from Allied Irish Banks will be called to give evidence concerning their knowledge of the potential source of the monies which funded these drafts. Specifically, the Tribunal has been endeavouring to establish whether Allied Irish Banks have retained any records concerning these transactions, bearing in mind that they occurred no earlier than 1991. And the final matter which the Tribunal will inquire into in relation to Mr. Lowry at these public sittings will be the circumstances surrounding the assistance given by Mr. Holly to the purchase by Mr. Lowry of premise at Carysfort Avenue, Blackrock in the County of Dublin. That will be dealt with in the course of Mr. Lowry’s evidence and evidence from one or two professional witnesses. I do not think that it would be appropriate to go into it in great detail at this stage, Sir.